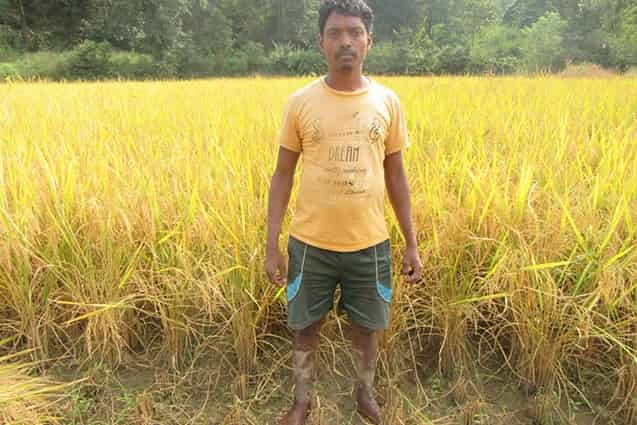 Till some time back, Rajesh Tirkey, a 35-year-old farmer owning two acres of land in a village in Khunti district, Jharkhand, was finding it hard to make ends meet. Given the perennial drought and high farming-related costs, he was barely able to meet household expenses, including his children’s educational needs. “It was during those testing times that SinduartolaGramodaya Vikas Vidyalaya (SGVV) and ActionAid India came to my rescue. Along with my wife, I attended a training programme on System of Rice Intensification (SRI) organized by them. The training helped me understand how to increase farm productivity through better management of plant, soil and water,” shared Rajesh. “Besides, SGVV and ActionAid India also assisted me in securing financial assistance from the government in order to implement those new lessons on my farm, buy seeds and lay a pipeline to bring water from a nearby pond,” Rajesh added. Then he applied SRI techniques in paddy cultivation. As a result, this year, Rajesh got a very good yield. The sale of the grains in the market brought him a huge profit. “Now, I don’t need to worry about how to meet my family’s expenses. I express my gratitude to SGVV and ActionAid India for all their mentoring and support,” said a beaming Rajesh. Along with Rajesh Tirkey, more than 1,400 farmers in Khunti district have been trained on and supported for sustainable farming practices, thereby bringing about a positive impact on their incomes and family nutrition.